It’s the easiest and smartest way to give them peace of mind. If anyone depends on your income right now, you need term life insurance. It protects your family by replacing your income—which makes term life one of the most important parts of your financial game plan. You need 10–12 times your yearly income in term life insurance. When that money is invested well, your family can live comfortably on the return of that investment. For many people, a 20-year term is just right. Why is term better than whole life insurance? Whole life insurance is a rip-off! It often costs hundreds of dollars more a month and includes a "savings" plan with a terrible return. Instead, pay a fraction for term life insurance and save or invest what you would have paid for whole life insurance. We need just a few details about you to give you accurate quotes. Have you used any tobacco products in the last 12 months? Dave recommends 10–12 times your yearly income. How many years of coverage do you want? Dave recommends 15- or 20-year plans. If you’re younger, consider a longer term because it’s still very affordable. Your quotes will be displayed on zanderins.com. The life insurance quotes are estimates based on the health class you have selected. Final rates are always subject to underwriting approval by the insurance company. There are many factors involved in the final approval price, such as (but not limited to) health history, lab results, family history and driving record. The Lampo Group, LLC, through daveramsey.com, provides advertising for third parties, including Zander Insurance Group. This form is provided as a direct link to Zander Insurance Group’s site. Information submitted by you is collected, stored and/or used by Zander Insurance Group for the purpose of providing the insurance quotes you request. daveramsey.com, with your permission, collects only your name, phone number, email address and postal code. All other information, necessary for the generation of an insurance quote, submitted on this form is directly linked to Zander Insurance Group’s site and is in no way collected, reviewed or stored by daveramsey.com. Likewise, all quotes are solely provided by Zander Insurance Group, and are not generated or provided by daveramsey.com. The Lampo Group, LLC, is not an insurance company or insurance producer and does not warrant any sites, services or information provided by Zander Insurance Group. 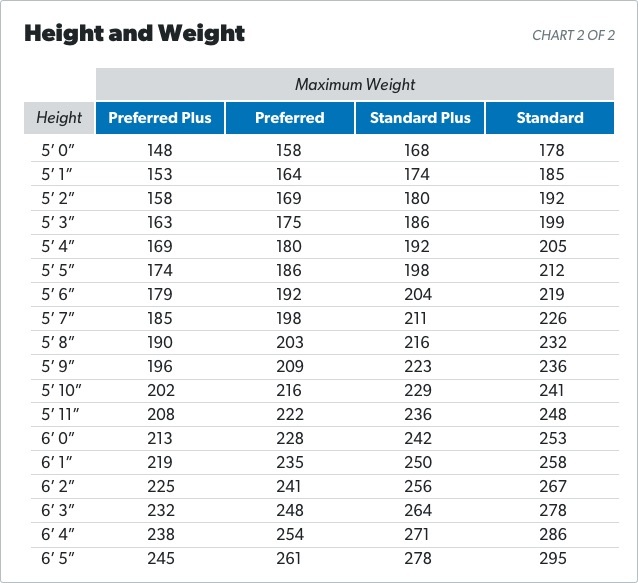 Using the “Health Factors” and “Height and Weight” charts below, choose one of the four health classes. Each company has different criteria, so these guidelines have been combined and simplified to give you the best chance of choosing your actual health class. Don’t worry, Zander will make sure your health class is accurate.